Though cops in particular get a bad rap for their doughnut consumption, this form of fried dough is beloved the world over. Often glazed or topped with sugar, sometimes filled with jam or custard, their most iconic shape is the round ring (though the holes themselves have become independently popular). Their history is murky; many theorize that Dutch settlers introduced the delicacy to the New World. What's not in dispute: their lip-smacking deliciousness. Despite the prevalence of American chains like Dunkin' Donuts and Krispy Kreme, Canada actually has more doughnut shops per capita than any other country. 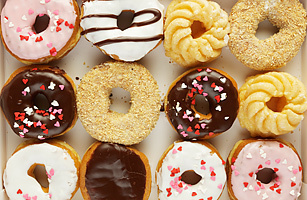 See the top 10 things you didn't know about doughnuts.